The workplace is a “blink” world: studies show that we form opinions of one another within seven seconds of meeting and that 93 percent of the messages people receive from us have nothing to do with what we actually say. So the ability to recognize and develop good nonverbal communication skills can be a huge professional advantage. Carol Kinsey Goman combines the latest research and her twenty-five years of practical experience as a consultant, coach, and therapist in this fun and practical guide to understanding what you and the people you work with are saying without speaking. Cartoons, photos, entertaining anecdotes, and dozens of simple and enlightening exercises help readers gain control of the messages their bodies are sending so they can project a more accurate and compelling picture of who they really are to their colleagues, clients, and partners. Carol Kinsey Goman, PhD, is president of Kinsey Consulting Services. She has worked with over 130 organizations in twenty-one countries. Her work has been featured on CNN, Bloomberg Television, and NBC News. 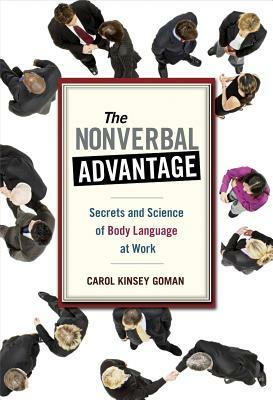 “Face-to-face communication takes on a new meaning in this much-needed and detailed treatise on nonverbal communication. Understanding how humans give silent clues—with eyes, hands, posture, and even feet—helps us become better speakers and better listeners. Kimberly Benson, Vice President, Cange International, Inc.